Led Zeppelin guitarist Jimmy Page will host a signing of his photographic autobiography, Jimmy Page by Jimmy Page, at Indigo in Toronto on Tuesday, July 21. Reissued last year, the book sold-out of its limited-edition run of 2,500 copies upon its initial release in 2010, becoming the fastest-selling book in Genesis Publications' 40-year history. With incredible attention to detail, the guitarist has chosen photographs representing the most significant moments in his career: from a schoolboy with a rock-a-billy quiff through his extensive work as a session musician; from The Yardbirds through Led Zeppelin, ARMS, The Firm, Outrider, Coverdale & Page and Page & Plant; playing with Roy Harper and The Black Crowes; collaborating with P. Diddy and performing with Leona Lewis at the closing ceremony of the 2008 Beijing Olympics. Page has officially put pen to paper about his career in this expansive edition. His words take the form of extended captions, which describe and document pivotal moments and events. He has also included visas, photos and stamps from his own passports. • 300 wristbands will be distributed on a first-come, first-served basis starting at 8:00 AM on Tuesday, July 21st at the Bay Street entrance of Indigo Bay & Bloor with the purchase of one (1) copy of Jimmy Page by Jimmy Page. • ONE (1) wristband per person. Only individuals with a wristband may enter the book stamping line. 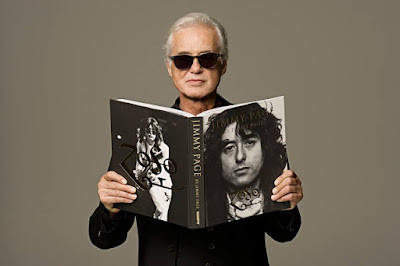 • Jimmy Page will stamp ONE (1) book per person. • NO personalization, exclusive stamped autograph only. • NO other books or memorabilia, stamping Jimmy Page by Jimmy Page only.